I’ve got a confession to make—I’m a horrible mother. Plant mother, that is. I certainly did not inherit a green thumb from my own mother. I’ve never succeeded in owning a plant and I’ve even killed cacti with my horrible caretaking. 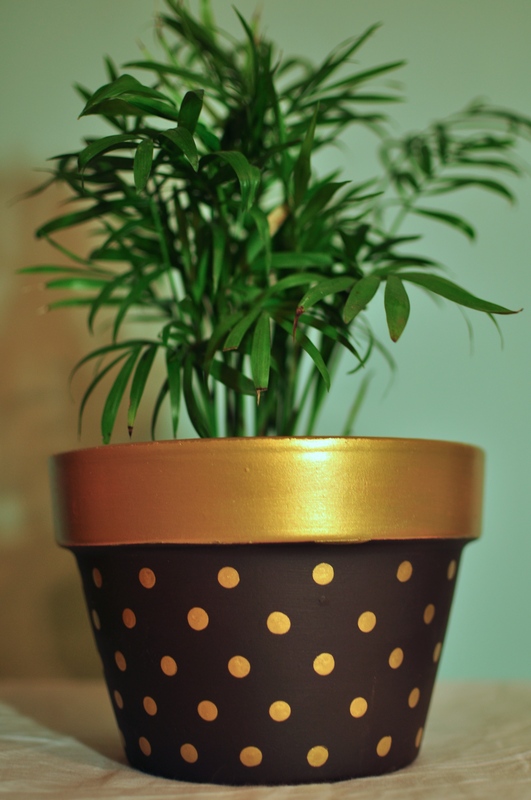 But one day at Home Depot, I decided to buy a simple terra cotta pot and give it a makeover to house a pretty plant, one that I am determined to help survive. So I grabbed a few acrylic paints from the craft store and got to work. Now, since I’m such a bad plant parent and don’t know much about taking care of them, I’m not sure how well these paints will work in the long run…but for now, they look pretty wonderful! This project was incredibly simple. I purchased a terra cotta planter, two small bottles of acrylic paint, and a pack of foam brushes and found a new pencil with eraser lying. Lay out a newspaper or paper towels to protect your work surface. Tape off the upper rim of the planter, if desired. 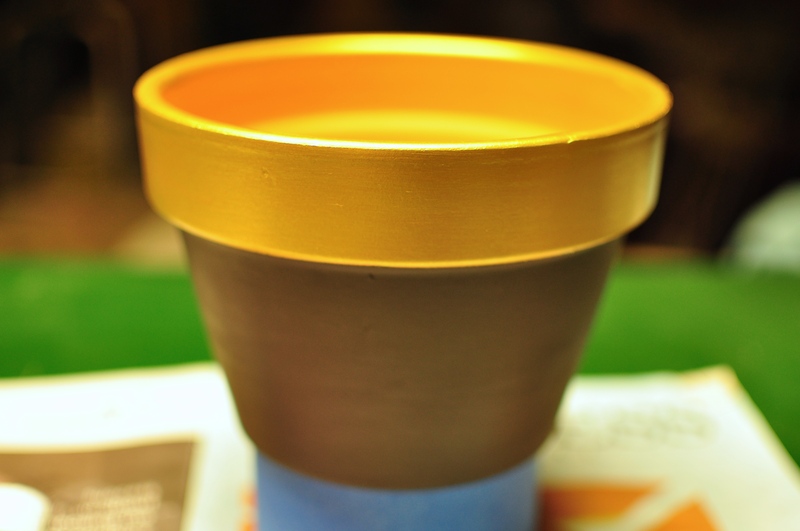 Using a foam brush, paint the base color on your planter. Let dry about 15 minutes and paint second coat. Once both base coats are dry, remove the tape from upper rim. Using a clean and dry foam brush, paint the accent color around the upper rim and let dry. Apply a second coat if needed. For the polka dots, dip a new pencil eraser in the accent color paint. 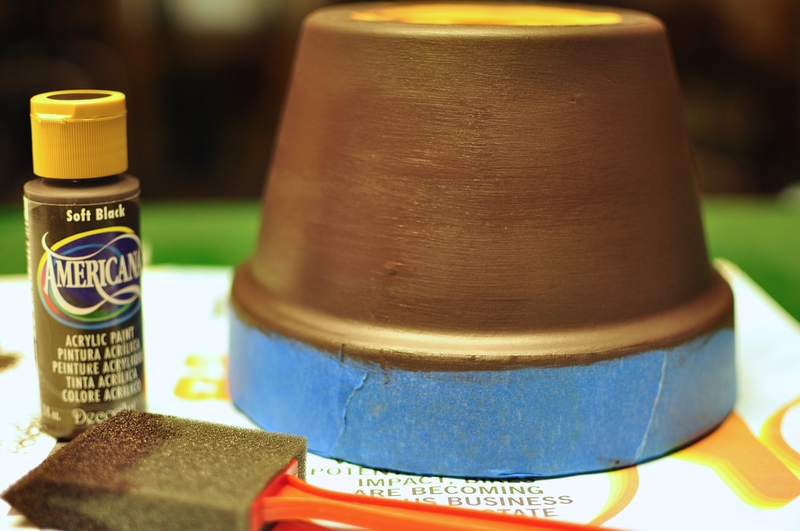 Apply the paint from the eraser to the base of the pot. You can choose to apply the dots in a random or an organized pattern, like the one I did. Give the pot plenty of time to dry before placing a plant in it. (I’d give it at least a day to make sure the paint is really fully dried. And voila! It’s super easy, really adorable, and would make a great gift! 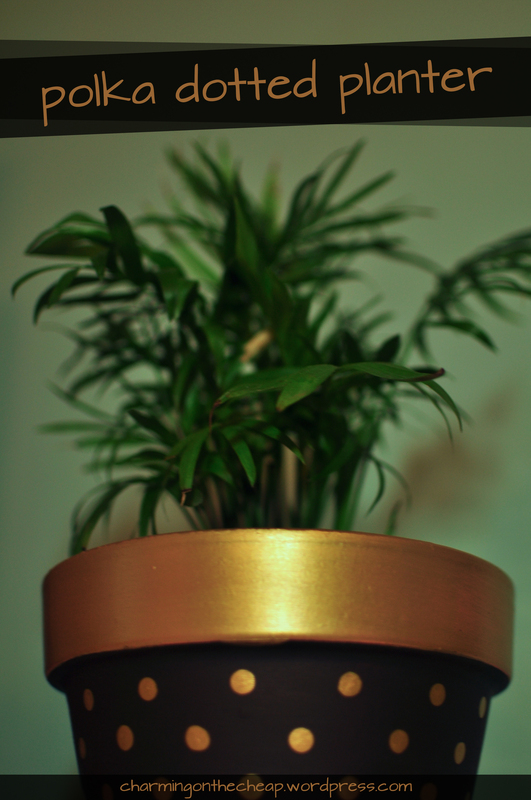 Or if you plan on keeping it around like I am, it makes a lovely centerpiece to liven up a table or desk. You can customize it to match any and every color scheme you want!